Nolan Morris may not be able to see his opponent, but the feeling he gets from competing on the judo mat is filled with passion for the sport he took up just 18 months ago. The eight-year-old from Dawson Creek, B.C., who was born without sight, competed in his very first judo tournament this weekend at the Edmonton International Judo tournament and earned a gold medal after winning all three of his matches in the U-10 category. “This is the best feeling in the world. I did all the hard work as a white belt, got my yellow belt and worked so hard for this day to finally compete in a tournament,” said Morris, who was born with Libras Congenital Fibrosis. When Nolan stepped out on to the mat Saturday morning his father Myles, mother Jennifer, brother Liam and sister Iya looked on with great joy. “When he first walked on to the mat, I had tears in my eyes, I was so proud,” said his father Myles. Despite his disability, Nolan was eager to learn and play a sport that he could compete in against able-bodied kids his own age. His parents tried him in various sports, but couldn’t find a fit. One day at the local recreation centre in Dawson Creek, they met sensei Bruce Sydnam, a long-time judo instructor at Norther Warrior Academy, who encouraged them to give judo a try. Now you can’t keep Nolan off the mat. “To be able to bring an opportunity like this to a young man who is visually impaired is quite an honour … it’s a real gift and a shining moment in my near 50 years of teaching judo,” said Sydnam. “Competition can help us define who we are and where we stand if not within society, but within ourselves and this gives him a chance to fight one-on-one with visually intact people, and he’s been absolutely incredible to teach. Training in judo can become a person’s lifestyle. It’s a form a martial art that people of all ages can learn and compete in well into their adult life. For Nolan, it’s also helped him live a more stable life. “He had pretty poor balance and body movement in tight spaces and it’s improved leaps and bounds in terms of stability and his ability to move through the world,” said Myles. Nolan won’t be the only member of his family competing this weekend. After seeing how much fun his son was having, Myles decided to take up the sport as well, taking part in the adult classes after Nolan’s finished training. Both he and Nolan are making their tournament debuts. “This is something we can do together all throughout life,” said Myles, who will compete in the adult division on Sunday. The Edmonton International Judo Championships has grown to become a global event and it’s one of the largest judo competitions of its kind. “This is our 11th year,” said tournament director Mark Hicks. The tournament is held at West Edmonton Mall, and that allows the event to be showcased in a different setting in hopes of growing the sport. Judo has become a very popular sport in Canada. Competitors from nine different provinces and two territories are taking part this weekend. It’s also used as a training ground for coaches, referees and volunteers. “It’s almost become a judo symposium,” said Hicks. Over the years, the tournament has had many former national and world champions compete, so the competition is strong, but it also has young athletes just learning the sport taking part, too. “It’s a full skill tournament. Some places only hold tournaments for kids, or just adults. We cover all the bases. It’s a tournament for all ages,” said Hicks. Stepping on to the judo mat can give a person a huge adrenalin rush as they get set to battle one-on-one against a fierce competitor. But for Rashad Chin, the feeling of adrenalin is something he experiences on a daily basis. When he’s not trying to throw his opponent on the mat and score big points, he’s doing his best to save lives and bring people back to strong health as an emergency-room doctor at the University of Alberta Hospital. “That’s the hardest question for me to answer because I enjoy both so much,” Dr. Chin said. “It’s a different type of adrenalin and I wouldn’t give up either of them. “Stepping on the mat and competing, you’re in the spotlight. There’s nobody there to back you up and you have to rely on everything you learned in training, and I love going against a competitor that is out to beat you. Dr. Chin won the silver medal in the senior men’s brown- and black-belt 60 kg division at the Edmonton International Judo Championships at West Edmonton Mall on Sunday afternoon. He’s been involved with judo for 25 years. He trains and teaches students at the Kodokwai Judo Club in west Edmonton. In the past, he’s helped organize disaster relief efforts in the Philippines, Haiti and Pakistan. So how does an ER doctor in one of the busiest hospitals in the province find the time to still compete in judo at a high level? “Time is demanding on everyone. But things that are important in your life, you have to make time for them,” said Dr. Chin, who finished medical school in 2008 and his residency at the U of A hospital in 2013. “As long as you prioritize your time properly, you can find ways to make time for things that are important in your life and judo is one of them for me. It gives me that stress relief away from the hospital. While his career as a doctor has taken him around the world, so has judo. He’s won back-to-back silver medals at the last two Canadian senior national championships and he recently won bronze at the Pan-American Championships. When he was younger, he competed in tournaments in Spain, Korea, Europe, the United States and South America. He won junior nationals in 1998 and in ’99 he won gold at the Canada Winter Games. “It seems like ages ago, but I still enjoy it. I have so many fond memories of competing,” said Dr. Chin. “I probably could’ve reached different levels in judo, but I didn’t have enough time to dedicate to it to get somewhere like the Olympics because it’s so demanding. But it never crossed my mind to give up judo completely. Fort Saskatchewan’s Alexandra Gagnon has dreams of being one of the best female judo athletes one day, and the 16-year-old is pulling out all the stops to try and accomplish that dream — even if it means moving away from home. She relocated to Lethbridge this year to take part in Judo Canada’s first-ever Regional Training Centre and she’s getting the opportunity to learn from some of Canada’s best judo athletes and instructors. She had a very productive weekend at the 2016 Edmonton International Judo Championships, earning a gold medal in the U-18 category and silver in the 54 kg senior women’s division. “I’m thankful for the opportunities I’ve been given,” said Gagnon. “I’m living with Lorraine Methot, who is one of the best athletes to come out of Judo Canada, and she’s really helped mentor me and help me with the transition. Gagnon is the youngest athlete to train out of the regional centre. This is the first year that the centre has been operating, and it’s the largest of its kind in Western Canada. She has participated in four junior national championships, winning a bronze medal her first time there. She hopes to compete in her first senior national championship this year, and the competition she faced on Sunday included many of the top senior level competitors. “Competing at the senior level is a pretty new experience for me, but I’m really happy with my performance today even though I wasn’t able to come out on top, I beat some of the girls that train out of the national training centre out of Quebec and have won senior nationals before,” said Gagnon, who lost to Quebec’s Camelia Pitsilis in the gold-medal match. “This is a big year for me. I’m shooting for a U-18 national championship gold medal, and I would like to get on the podium for senior nationals. Gagnon also received the Stephanie Kerr Award for hard work, dedication and spirit. Kerr, who was from Edmonton, was an outstanding judo athlete who died in a car accident in 2005. The 2016 Pacific International Judo Tournament is one of the most important competitions on the Judo Canada competition circuit with 350 athletes from USA, Japan and across Canada competing at this prestigious event. This competition is a national team ranking competition where athletes gain valuable points and standards in effort to progress them onto national teams. Alberta won 40 medals over all on the weekend; winning 18 gold medals, 10 silver medals and 12 bronze medals. Team Alberta was represented by clubs from Edmonton, Fort Saskatchewan, Spruce Groves, Airdrie, Calgary, Pincher Creek and Edmonton. There were several outstanding performances during the weekend with Taeya Koliaska, Joel Demaere and Hana Varsanyi from Lethbridge winning two different age divisions over the weekend. The next stop on the Judo Canada competition circuit is the Edmonton International Judo Championships running from March 11-13, 2016 at the West Edmonton Mall with over 750 athletes participating from across Canada and the USA. To view the tournament results please click here! Judo Alberta, the City of Edmonton and the province of Alberta are pleased to announce the successful bid to host the 2015 Pan Am Judo Championship. This prestigious international event will take place at the Saville Sports Centre in Edmonton on April 24 – 26, 2015. Judo Alberta is proud to partner with Hatashita International as a sponsor of the 2013 Alberta Provincial Judo Team. Hatashita International has come forward to provide significant discounts to Provincial team members competing at the 2013 National Championships in Vancouver from July 4-7, 2013. See the full press release here. Judo Alberta’s Cassidy Norris & Caitlin Alder have been selected to attend a Training Camp in Japan as part of Judo Canada Women’s National Team! See complete details here. Pordenone, Italy – Judo Alberta’s Kelly Palmer and Gord Okamura recently competed in the 2012 World Kata Championships in Pordenone, Italy (about one hour north of Venice) on September 20-23, 2012. The pair placed 10th overall in Katame no Kata (Forms of Ground Technique). See the complete press release here. Cali, Colombia – Judo Alberta had two athletes, Cassidy Norris (U20) and Alexandra Surbey (U17), represent Canada at the recent 2012 U17 and U20 Pan-American Championships in Cali, Columbia on September 6-9. 2012. See the complete press release here. The Judo Alberta Grading Board is pleased to announce the Provincial Kata Team Selections for the 2012 National Championships! Congratulations to all athletes that will be representing Alberta in July. Please see the complete kata team selection here. The Judo Alberta Coaching Committee is pleased to announce the Provincial Team Selections for the 2012 National Championships! Congratulations to all athletes that will be representing Alberta in July. Please see the complete team selections here. The Albertan judoka, Darren Elcock, placed ninth in the under 50 kg division at the cadet World Championships, a competition that brings together all the best under 17-year-old athletes, in Kiev, Ukraine. Check out the full press release from Judo Canada here. Hi everybody – Gord Okamura and I went to the World Kata Championships in Budapest on May 25 and 26. Overall, we placed 9th in Katame no Kata and 8th in Goshinjutsu – about where we’ve placed for the last two World Championships in Paris (2008 – 8th place) and Malta (2009 – 7th place) – so that gives us four top 10 finishes in the World Championships to date. Other Canadian teams were 16th in Nage no Kata (John Morris and Stephen Duran from BC), 21st in Kime no Kata (Roger Beauchesne and Julius Bute from Quebec); 21st in Ju no Kata (Diane Hardy and Daniel Ferland from Quebec); and 20th in Goshinjutsu (Roger and Julius again). But wait, there’s more – I’ve been looking at the numbers some more, and the above results really don’t tell all the story. The tournament was much bigger this year. 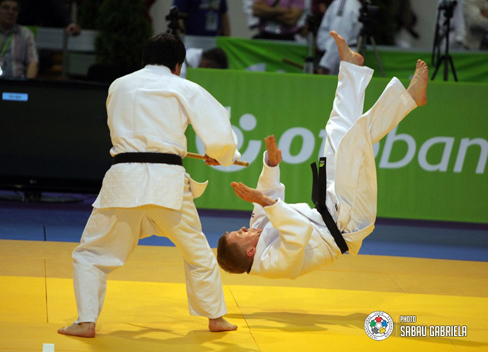 In both the Paris and Malta tournaments, countries could send a maximum of two teams per Kata. This year, there was no limit. While some countries (Japan, Spain) still sent only one team per Kata (largely the same teams each time), other countries (France, Italy, Portugal) sent very large teams – Italy in particular sent multiple teams in each Kata. Italy’s program obviously has a great deal of depth, as they had a number of medal winners and teams in the finals. For comparison – in Malta there were a total of 14 Goshinjutsu teams – in Budapest there were 26. In Malta there were 18 Katame Teams – in Budapest there were 32 – so in each case the number of teams had nearly doubled. As with the previous tournaments, teams were divided into two pools, with the top 3 in each pool advancing to the finals. In the previous tournaments, the smaller number of teams resulted in a “tough” pool (where usually two of the previous medal winners (Japan, Italy, Spain) were), and an “easier” pool, which generally had one medal winner (in both Paris and Malta, we were in the “tough” pool!). In this tournament, because of the depth of the teams there was no “easy” pool – both sides of the draw were equally difficult. In our pool, we had the eventual Gold and Silver medalists Japan and Italy, Spain (who had won Silver in Malta and Bronze in Paris, but did not medal this year(!)) and previous finalists Germany and Belgium. The other pool had very strong teams from Iran (this year’s Bronze medalists), Italy (previous medallists in Paris and Malta), Brazil and Portugal. The caliber of these teams was very high – so high that Spain did not medal. That we were able to maintain our relative standing in light of the increased numbers is good. But the Katame scores also tell something interesting. As before, there were 5 judges, with the top and bottom scores being discarded. Our scores were very encouraging. One judge (not Canadian, don’t know from where) gave us first place – our score was higher than Gold medal Japan’s score, including from this judge and all the others. As well, another judge had us tied with Silver medalists Italy. Sadly, our top score was discarded, and the remaining scores were in the 8-9 range – and there we wound up. In our Goshinjutsu Pool, we had the eventual Silver and Bronze medalists (both from Italy) as well as previous finalists Portugal and France. Our Goshinjutsu scores placed us 6th in our pool, 8th overall. We had a Canadian Judge who gave us a score higher than the Silver medalists Italy – but as it was our high score, it also was sadly discarded. Goshinjutsu – Spain (Bronze medalists in Paris and Malta) made a major mistake on one of the techniques, and so did not advance from their pool to the final. Japan (Gold medalists) made a major mistake in the final – on the first Gun technique (Shomen Tsuke) the Japanese Tori dropped the Gun! They still won…..
Kime no Kata – There were two Italian teams in the final – and during the final, last year’s Bronze medalists were doing very well until Uke forgot a technique! He remembered the correct technique before he went too far, and so still did it – but that mistake likely cost that team a medal. The other Italian Team won Bronze. Just goes to show that even the big guns can make mistakes. There were cameras set up and filming of the katas was ongoing, but so far I haven’t seen anything posted on any websites except for a few private videos on YouTube. However, the IJF had several photographers around, and have posted pictures on the IJF website (www.ijf.org, where this photo is from)– here’s a picture of us from our Goshinjutsu! We had a great trip to Budapest – very pretty city, lots to see, great beer! This was the first World Kata Championships, held on the island nation of Malta. Last year the IJF held a test event (the IJF Kata World Cup) in Paris, and this event was run in an identical fashion. Overall, we placed 7th – up one place from Paris where we placed 8th. As with Paris, the teams could only compete in one Kata each. Each Kata was divided into two pools, with the top three in each pool advancing to the final – we were #4 in our pool, and higher than the remaining teams in the other pool (so the top 6 teams went to the finals – we were #7. Ouch…). In our pool were Spain (the eventual Silver medalist) and Italy (Bronze). They were teams #1 and #2 advancing, with Germany (who were slightly ahead of us in Paris) being the third team. However, I got a look at the score sheets – there were 5 judges. One judge had us in second place, and the next two had us about even with third place. This left the Spanish Judge and German judge, who gave their marks to Spain and Germany respectively…. While we were disappointed to be so close to the finals and not get there, we improved over Paris – and I guess being #7 in the world is a good place to start! In Malta, all of the medalists were Japan (Gold in each) with Spain and Italy getting all the silver and bronzes (save one – in Nage no Kata, the Paris Gold medalist from Romania had to settle for Bronze) – and in almost all cases, it was the same teams winning in Malta that had medaled in Paris. We also noted that scores generally were tighter and lower than Paris – while our score in Malta was lower than our Paris score, the same was true for all teams (including Japan) – so I think a direction had gone out to mark tighter. As with the Paris tournament, each of Japan, Spain and Italy devoted tremendous resources to international Kata – each of these countries has large teams which include coaches, managers and trainers – the budget of all other countries combined may not reach theirs! Saw some great Kata (the Kime no Kata this year was especially good), toured around Malta (very pretty) and drank lots of Maltese beer (Cisk brand – not bad!). Once again we learned a huge amount, and look forward to sharing our experiences with Judo Alberta!